Keep your cherished treasures in this elegant trinket tin. This lovely tin is practically perfect for storing trinkets, treasures and other Gorjuss things. Too pretty to put away, this item was made to be seen on your dresser, bookshelf or windowsill. Inside, your jewellery, craft items or even your lovely little sweets will sit suitably amongst warm creams and faded oranges in a floral pattern; the perfect storage solution for your little bits and bobs. 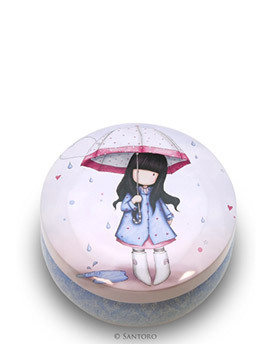 Tin size: 6 cm height with 9 cm diameter. Funky Divas - Memorabilia in Devon, Gift Ideas North Devon, Body Piercing in Barnstaple, Body Jewellery in Barnstaple, Watches and Bags in North Devon.